Orzo salad is an easy one-dish, summertime meal. You could add anything you like, so you can adapt the recipe to fit whatever you find at the market. The most labor intensive work involved in preparing the salad is chopping all the ingredients. For this version, I added cherry tomatoes, broccoli, sugar snap peas, pickled carrots and canned black beans. The main event though, was the addition of the roasted beets. I prepped them in the morning and let them cool to room temperature. We spent a very low-key, relaxing weekend and I didn't feel like cooking a ton, raising the temperature in the kitchen with the stove and oven during the afternoon, as the temperature got higher. 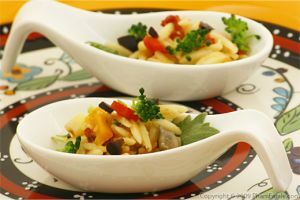 This cold pasta dish was light, complete but still flavorful, and we got to enjoy it by the scoopful in our garden. For the pasta salad dressing: Use a sealable container (such as a mustard jar, previously washed with hot soapy water). In this order, combine honey, 2 tablespoons vinegar, mustard, pickled garlic and grapeseed oil in the container. Seal the container and shake until emulsified. Mix well. Set aside. Scrub the beets under tap water. Remember to trim off a little piece from the ends of the root. 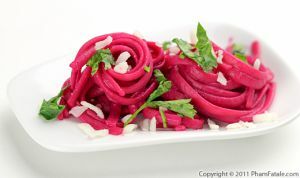 Reserve the beet leaves (if any) for another dish; they're edible. Peel and cut the beets into 1"-thick slices. Place in a large bowl. Drizzle with about 2-3 tablespoons of canola oil. Season with salt and pepper. Toss well. Spread them on a baking sheet. Roast for about 45-50 minutes. Let the beets cool completely. Dice the beets into 1-inch cubes. Add the beets to the orzo pasta. Toss until the pasta becomes evenly pink. Drizzle with the remaining vinegar. Chill in the refrigerator until you're ready to serve. For the broccoli: Blanch the broccoli for 3-4 minutes in boiling water then transfer into an ice bath. Drain thoroughly, then pat dry on a paper towel. Don't over-cook, as the broccoli should still be a little crunchy. Cut into small pieces. Note: You can blanch both the broccoli and sugar snap peas at the same time. Wash the sugar snap peas. To trim them, snap the ends between your fingers and pull out the fibrous strings on each side of the vegetable. Boil the sugar snap peas in salted water for about 3-4 minutes. Drain the liquid and immediately transfer to an iced water bath. Pat dry on paper towels. Cut into thirds. Season with salt and drizzle with 1 tablespoon grapeseed oil. Set aside. 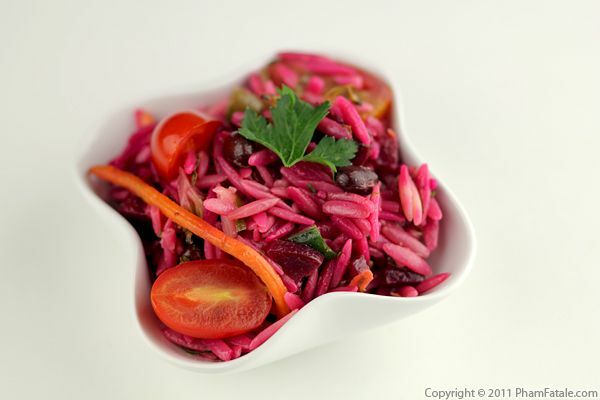 Combine the orzo, beets, tomatoes, pickled carrots, broccoli, sugar snap peas and black beans. Add parsley. Drizzle about 3-4 tablespoons pasta salad dressing. Serve all the ingredients at room temperature. Drizzle with more salad dressing. Adjust seasoning with salt and pepper. Toss well. The key to good pasta salad in general is to have a flavorful vinaigrette. 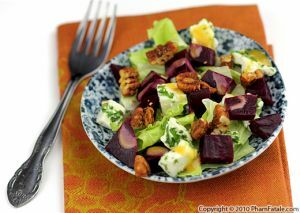 To give the salad a richer mouth feel, you could add 2 to 3 tablespoons crumbled feta cheese or blue cheese. Published By: Jacqueline Pham on July 25, 2011.